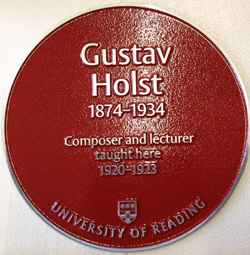 Gustav Holst was teacher of harmony and composition from 1920-1923. He also conducted the College’s orchestra and choral society. In 1923 he fell from the stage in the Great Hall while conducting, suffering a mild concussion. Material from the University’s archive has revealed the esteem in which students held their illustrious lecturer. He is described as ‘a curious blend of the visionary and the practical – a rare combination indeed’. His teaching style was ‘to draw out of his pupils all that was best of them by any means in his power’ and ‘making them learn by doing’. The secret of his teaching success ‘came as much from the joy which he got from music and with which he infected them’.